The image of a dead child on a beach has brought international attention to a long-simmering crisis. The photos of Alan Kurdi’s lifeless body has focused the media on the humanitarian catastrophe that is Syria. Broader awareness of the Syrian refugee situation has provoked response among European and North American citizens, with many voices calling for admission of more asylum seekers, and others opposed for reasons of security or cost. Demonstrations and lobbying have obliged government leaders and opposition politicians to define their positions and hopefully take action to open the doors to refugees —or keep them closed. The Syrian crisis, through the tragedy of the Kurdi family, has unexpectedly become an election issue. Since the Kurdi photos, political leaders have been addressing the issue and attempting to define their positions. Two examples are Stephen Harper’s defense of Canadian refugee policy and quotas as measures protecting the security of Canadian citizens, while Justin Trudeau referenced past examples of rescue efforts, such as the airlift of Asian Ugandans carried out by his father’s government in the early 1970s. These two positions reveal the tension that has traditionally existed regarding refugees: the fear of harm to society versus the imperative to provide shelter to the vulnerable. We do not need to go far back to observe another moment when the tension between security and assistance mobilized Canadians and precipitated government action. After the overthrow of the government of Salvador Allende in 1973, hundreds of thousands of Chileans associated with the leftist parties in Allende’s coalition and revolutionary movements sought asylum. Canada already had a tradition of accepting refugees, with notable efforts to resettle Displaced Persons after World War Two, Hungarians in 1956, and Czechoslovakians in 1968. Many civil actors, such as the Canadian Conference of Churches and unions throughout the country, expected the state to make similar efforts to aid Chileans. However, the fact that the Chilean refugees were from the political left, and some of them avowed revolutionaries, led the government to drag its feet out of fear of communist infiltration. In the context of the Cold War, admission of anti-communist Hungarians and Czechoslovakians was seen as part of the fight for freedom, but sheltering victims of right-wing violence was a security threat. There are parallels to be drawn with the Syrians today. The Cold War is long over, but the fear of Islamic extremism provoking domestic terrorism has replaced it. Some ask if making more active efforts to resettle Syrians in Canada will leave citizens vulnerable to attack from terrorists who gain entry under relaxed Canadian admission criteria. Their pro-admission counterparts dismiss this as alarmist, unlikely and cold-hearted. The Canadian state, meanwhile, has to determine how to uphold the nation’s tradition of humanitarian assistance while maintaining public security. In the case of the Chileans, effective public lobbying forced the government to take action, and commit resources to the resettlement of over 6,000 people in danger between 1973 and 1978. 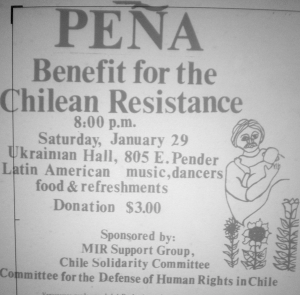 At the same time, private citizens were also mobilized to sponsor Chilean asylum seekers and to help them resettle by providing items needed for daily life, such as bedding, utensils, clothes, and even toys for children. This model of public-private partnership was applied on an even greater scale in the early 1980s when Canadians opened their doors to the Indochinese refugees commonly known as Boat People, efforts which earned the people of Canada the Nansen Refugee Award from the United Nations. Throughout the country groups such as Lifeline Syria are willing to act as sponsors of refugees and thus lessen the cost of resettlement borne by the government. Despite the security worries, is it not time for the government of Canada to acknowledge the wishes of thousands of Canadians to help their fellow human beings? 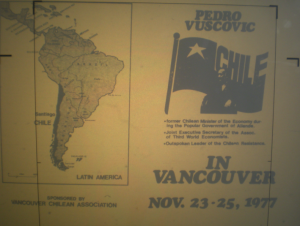 Chilean refugees admitted to Canada became an active and integral part of our society, and posed no danger. There is no solid proof that Syrians refugees would be any different. Francis Peddie is a historian of Latin America and Canadian Immigration. Originally from Toronto, he now teaches at Nagoya University in Japan. 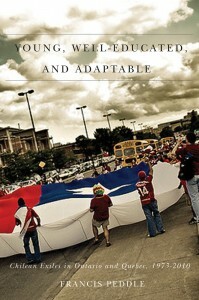 He is the author of Young, Well-Educated, and Adaptable: Chilean Exiles in Ontario and Quebec, 1973-2010 (University of Manitoba Press, 2014).